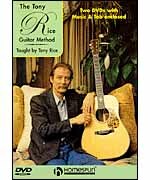 Tony Rice Guitar Book contains exact transcriptions of all the solos on the first three albums of the leading acoustic guitar player now living. Each solo is written in both tablature and standard music notation, showing the precision and syncopation that has had a tremendous impact on both bluegrass and new acoustic music that started with the Dawg era. Solos are taken from Tony Rice Guitar- Rebel SLP 1582, Tony Rice- Rounder 0085, and Manzanita - Rounder 0092. No Tape or CD available. Marty Stewart's lead guitarist 'Brad Davis' teaches 11 classic Tony Rice solos! In this course Brad teaches 12 solos in the style of Tony Rice. These are not note-for-note copies from recorded versions, but are true to the style. Tony Rice is known world-wide for his spectacular technique, brilliant improvisation and powerful soloing. In this lesson, he passes on to you the style he has developed. In careful detail, Tony analyzes licks, runs, solos and rhythm parts to bluegrass songs. and fiddle tunes that will challenge and delight all flatpickers.